So! Who’s in the mood to read a book that will hook you from the first few lines, make you smile, make you laugh, make you ABSOLUTELY fall in love, and then sigh and sigh and sigh again? YOU? OF COURSE YOU! 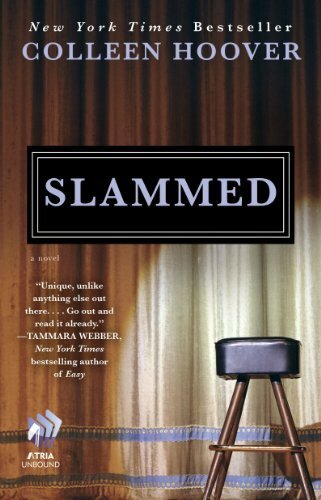 Maryse’s Book Blog: I LOVED SLAMMED!!! One of my best books of 2012, EASILY and now, one of my all-time favorites too!! Here is the book that kept me up until 2am (laughing and crying and sighing). But I’ll give you something even better. At first (wayyyyyy in the beginning…. ), I prematurely thought that this book might be too easy in the “love department”. That maybe… even though the writing was witty, and completely in tune with me, that just maybe, the romance aspect might be *too easy*. HA! What did I know?! Nothing!!! That’s what!! Cause I was simply blown away at a certain early revelation in the book, and then every moment after. I was all… No. FREAKIN’ WAY! I was on the edge of my seat for the entire way after that. Sure, the book might be laugh-out-loud funny, (there are so many times I giggled with glee) but the romantic tension is off the charts, and the circumstances for all… just INTENSE. And that’s not all. ‘Cause it’ll make you cry. No. Wait, let me take that back. SOB. Sure. But then… oh. my. goodness. AM I SOBBING? Why YES. Well whatdya know! I am. No those aren’t just a couple of tears collecting at the corners of my eyes (easily hidden by a quick and easy swipe). Nope. Those aren’t just a few tears running down my cheeks. Nuh uh. I’m full on snorting. Too far gone to keep it from my husband had he been awake, but who, (I am thankful), is in full-snore mode. Usually when he’s that deep in, I can get away with the red-faced, sniffling, snorting, puffy lipped, full-on crying. I was wiping my face with my pajama top, and no matter how much I wiped, my face was soaked. And so was my top. Why didn’t I use tissues? Remember that flu I had a few weeks ago? Well. The tissues that I had left from that episode are Menthol (Vicks) flavored. Errr… probably wouldn’t help my tear situation any. 😉 My dog even felt the need to comfort me, and I giggled which immediately set me into more sobs. What do they call that? An ugly cry. Yah. Glad y’all weren’t watching. But I DID have moral support! My Facebook girls, including THE ONE that recommended this to me! Christina: Holy Moly. I just finished reading Slammed by Colleen Hoover, and let me just say this, I hardly ever cry when reading but this book had me sobbing. The love story and the way life unfolds in this book is just amazing. You ladies really need to read this one. Wow. Y’all I am not kidding when I say that I laughed and I cried. It’s been a long time that’s happened. There are 2 books. The first is on Lakes POV, the second book Point of Retreat is in Will’s POV. I read both back to back. Peggy: The summary didn’t do it justice but between your rec and another poster, I went ahead and downloaded it…OMW…just started, loving it! Nancy : Thanks for the info!! Just got it! Maryse’s Book Blog: Oh no!! Noooooooooo! Christina: Isn’t it just amazing? The second one is good as well. I’m jealous you are reading it for the first time. Colleen!!!!! You freaking rock!!! I have NEVER cried as much as I did in these books!!! Christina: Maryse, seriously? These books are THE BOMB! You laugh, and cry so much! And the Avett Brothers fit perfectly with the whole book. I could imagine every one of those songs when they were mentioned. Maryse’s Book Blog: Hehehehe…. Chuck Norris is killing me… So good! Christina: Haha! I know the Chuck Norris was awesome! I sooooo wish I could talk to you while you read! Which part are you at? Maryse’s Book Blog: Wow. Just… Wow. Another amazingly awesome read. Am I crying again? Tomorrow book #2 for me. I’d totally start it now, I don’t really feel like sleeping, but gotta work tomorrow. Jamie: You guys are KILLING me!!! I am running off to read it right now! I HAVE GOT to know what you guys are all crying about!!!! Jumping off the computer now to tear into my kindle! Jamie: Whoa…Ok, I am currently reading Slammed recommended by Maryse and Christina. I was curious to see what “Slam poetry” looked and sounded like…so, I googled it. Anyone reading this book….watch this! WOW! Now I understand Lake’s response to Will. HOLY HECK!! Jamie: Girl, I swear, I am 25% in and I am HOOKED! Where in the heck has this book been hiding? This is what I love about reading!!!! So good! 🙂 oh, and to answer your question….yes, it freakin’ ROCKS!! Don’t let that cry scare you. This book stole my heart and STILL has it, but I’m glad to hand it over! In fact, All I want to do is immediately move onto book #2. Which, happily, is already on my iPad. 😉 YAY ME!!!!! Oh right!!!! You want to know what’s it’s about? Ahhhh this is one I can barely tell you a thing, because you need to get the full impact to fully appreciate it. I will tell you only this. It’s about a girl (18), who moves to a new city with her recently widowed mother (father just died) and her very young brother. Then she meets new friends at school and in her neighborhood. And she (and I) I learned about slam poetry. And it’s sort of YA, but really? I really didn’t feel it necessary to provide a “category” for it. Sure. It’s… *clean* but it’s SO darn entertaining, so profound and SO extraordinarily passionate, that you really don’t need anything else. And I’m leaving it at that. Oh wait!!! I wanna play slam-poetry too!! You slammed INTO me. Slammed right through me. Slammed to the other side of me. Eviscerated my heart. But you took those ragged pieces and taped them together. I am ready for #2. FIVE STARS PEOPLE!!! FIVE OF ‘EM!!!!! Oh WOW look you guys!! The author just sent me this awesome little tidbit and video. A SLAM poetry artist performed her piece!! I am so upset that the eBook version isn’t available through Barnes & Noble.. you have me just dying to read this book now!!!! I hope it’s available soon. Thank you, thank you, thank you Maryse for reviewing this book!! I just finished reading it straight through and I loved it!! Seriously, I think it is my fav of the year so far and I have already read 40 books this year (a lot of good ones too)! I downloaded this a while back and it may have just stayed in my huge pile of Kindle books that I fear I may never get to if I had not seen you mention it on facebook. Now I am wondering what other gems I might be missing out on that I already have!! Anyway, thank you again! Love your blog!! OMG. Great Book! Seriously. For such a short book, I spent an incredible amount of time crying and laughing til I cried. Ok, so the second book is already out…not sure you guys saw that…I have purchased and will be commencing the reading aforementioned second book IMMEDIATELY. Ignore that last comment lol I missed that part of the review. oops. I picked up the book yesterday – I’m finishing Mr. Impossible then onto this one. I’m curious whether I will have the same reaction you did, Maryse. I think I am exactly like you when I come across the tearjerker parts of a book. I may tear up a bit, or “know” that’s the sad part everyone is talking about, but I don’t start actually crying. Up to the second book! OMG. Girls, you are all in for such a ride! When you say read it, I definitely do! I read both books this weekend and cried like a big fat baby!!! I absolutely LOVED these two books!! My heart was wrenched throughout the whole weekend! Husband, kids, what husband and kids?? I thanked Colleen Hoover immediately following and told you sent me! Thank you Maryse for telling us about them. Definitely worth re-reading!!!! Yay!! ahhhhh!! I Just found out that Amazon is having some temporary technical difficulties (for the Kindle books). Probably will be fixed REAL soon. Wow, I cannot thank you enough for recommending this book. I love it! I am half way through the second book and like this one even more. I thought that would be impossible, but no. These books KILLED me. They TORTURED me. And I loved every second of it. The second one is even better. Butterflying bemazing! WOW!! Blew through both books in one day!!!! LOVED them!!! GAH!!!! I LOVED IT! Thanks for the recommendation! Lemme just say… WOW!! Started Slammed on Sunday at about 9 or 10pm and couldn’t put it down! Read it till I was finished at 3 am! It put me through an emotional roller coaster. Right when the tears would start flowing, I would laugh outloud. I was emotionally wiped out when I crashed but in such an awesome way! This book and the Point of Retreat are fantastic… not to mention it caught me off guard a little when I saw that I was a character … hehe 😉 Thanks for the awesome recommendations! Thank you everyone so much for your comments! Just wanted to let those of you with Kobo and Nook know that both books are now available on Smashwords and should be on Barnes & Noble later today. Thanks again! Wow wow and wow I started Slammed yesterday afternoon and finished late last night! I loved it so much, totally took me by surprise and my poor heart is still recovering. Now I’m hoping I have a slow day at work so I can catch a few chapters of Point of Retreat! Thank you Maryse for finding and sharing such a wonderful book! Oh I loved it…..finished it in one day! I really liked how it was from Will’s point of view…..I liked being in his head 🙂 I actually liked Slammed better and only because I didn’t see a lot of things coming. On top of the favorite list!!!! I totally loved Slammed and Point of Retreat. I read a lot and I have to say that it has been years since a book made me cry. I was just sitting there sobbing like a baby. I have to say that I did not want to go go work but keep reading. Oh My Gosh!!! I absolutely LOVED this book! I fell in love with the characters, and it was funny and heartbreaking all at the same time. I couldn’t read Point of Retreat fast enough. I havent read books in 25 years, this March I read the 50 Shades Trilogy twice and I have been unable to put a book down since then, reading 1 a week, it’s amazing awhole different whole I have discovered. I have found all of my books since “50” from your blog….I am 75% into Slammed and I cried last night reading this has never happened, I have gotten a heavy chest, choked up or water eyes but I actually was crying…so foreign to me over a book…. I don’t want to finish, I don’t want it to end. Was she carving pumpkins? That’s where the tears really got out of hand for me. Yes Carving pumpkins and leaving the laundry room…..Ran home at lunch to get in a few pages…I Don’t have a kindle yet so I cannot get some of your books until they get to print.. After Slammed I will move onto Point of Retreat. I hear a sequel from Beautiful Disaster will be coming soon. Done…. onto Point of Retreat..can’t wait..
Ok, I get through 49% of this book and I think, this book is not that sad…. why is everyone saying they are crying! Then bam…..I get slammed with emotion! My husband is next to me saying why are you crying! What an awsome book. On to point of retreat. Patty, I was the same way. I read 50 shades In Aug and have not stopped reading since. I love how reading makes me feel so alive! Maryse is great, I check her blog several times a day to see what I should read next. What a great book….first book that ever made me cry! Don’t get me wrong, I’ve definitely felt serious sadness for some characters in the past but this one really got to the core. I also laughed, got mad, excited, angst….it was a crazy whirlwind of emotions. Just wanted to give 2 thumbs up before I start the next book. Maryse- did you read/review the 2nd book as well? I am staring at this box for a while now….I want to write a comment because this story deserves one but ‘wow’ I am speechless. I read the 2 books in the last 2 days and I have cried and laughed and smiled and sigh a lot. I couldn’t stop reading but I also didn’t want it to end! This books are in my ‘forever list’. I finished reading both Slammed and POR a couple of days ago and LOVED them BOTH!! When I first read the reviews-way back when, I thought… I really don’t want to get into a book that will make me want to cry right now. But it’s really not like that… it’s so much more than that with a range of emotions. Like with some books, you sometimes feel devastated at times and just want to break down and sob. I was so surprised by the story line… it was awesome!! Honestly, it’s best to go in blind and see what happens (you don’t want spoilers). I regret putting off reading these books, so that is why I wanted to share this with those of you who are on the fence. You WON’T be dissapointed!!! !